This article describes spatial planning processes at local government level in the Netherlands in relation to opportunities for children to play and explore the outdoors close to home: in their neighbourhoods, and in early childhood care and education and school services. In 2009 the Department of Children, Care and Welfare in the Province of North-Holland wanted to research the extent to which children and youth are taken into account in spatial planning across the province’s 61 municipalities. The department hoped to increase their understanding of how municipal governments could help meet young children’s needs for learning, development and wellbeing, in ways that would also improve the social functioning of neighbourhoods. Key questions were: What is the local government policy perspective on children, spatial planning and the physical environment? Which sectors and departments in municipal governments are involved? Who has power and influence? Who takes the initiative? What actually happens in practice? And how does all this relate to broader research findings? Methods used were a review of local policy documents and plans, and a survey among civil servants and policy officers, complemented with in-depth group interviews with staff from a range of departments. There are five broad types of places distinguished in which children can play, learn, meet other children and generally grow, develop and discover the world. The article will consider them in turn. Formal play spaces are all the physical places specifically designed for children’s play. They include such places as playgrounds, football pitches, play gardens, and places to ‘hang out’. The research reveals that formal play spaces, of all five types of spaces, receive by far the most policy attention at municipal level. Municipalities in the Netherlands are advised to ensure that 3% of developed land should be reserved formally for the playing needs of children, although this is not compulsory. The national government has no policy on play, but most municipalities have local Playspace Plans. The number of formal play spaces planned locally depends on the ages of the children to be served, and the distance from their homes. Younger children are seen as needing play spaces nearer to home, which consequently tend to be smaller and more widely dispersed. Play spaces for older children, which may include facilities for skate-boarding or playing football, tend to be fewer, bigger, and further from residential housing. It is unclear whether this system of planning and distribution actually serves children well. In practice there are many small, unattractive and sometimes badly maintained play spaces distributed around the neighbourhood. 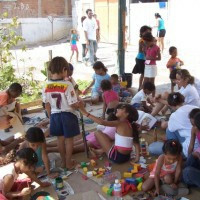 Only one municipality tried to change this situation and developed larger ‘play oases’, catering to the needs of different ages and interests, and of bigger groups. All municipalities complain about the growing safety regulations that make the building of attractive play equipment “a hell of a job”. Evaluations of children’s experiences of play spaces rarely take place. 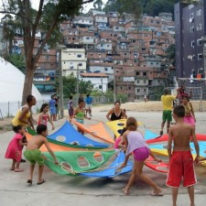 Municipalities do not set out to answer such questions as: What is the pedagogical and social climate in the playgrounds? Do girls use them as much as boys? (Research indicates they tend not to). Do many small playgrounds attract the same amount of children as fewer larger playgrounds? Which groups of children? In which kinds of neighbourhoods are many small play places better, and in which kinds of neighbourhoods is a concentrated approach better? Informal play spaces are all the public spaces in the neighbourhood that are not specifically designed for children, but are also meant for children and youth, such as green spaces, parks, canal sides, beaches, sidewalks, shopping centers and empty car parks. Such spaces require the municipality to develop a broadly child-friendly approach to spatial planning. Research reveals that such policies hardly exist. Reasons cited included an absence of norms and guidelines, the cost of land, and the competing demand for car parking. Recently, pleas are more often made for broader sidewalks to accommodate playing children. Some municipalities try to create child-friendly spaces in green areas such as parks, dunes and woods. They try to arrange more ‘wild’ and ‘messy’ or less organized green spaces, and they are sometimes successful. But they are operating against a trend for tidy and arranged green spaces, particularly when those green areas are privatized. Although nature and play is a hot topic in the Netherlands at the moment, good practices are still rare. Or, as one of the policy makers admitted, “There is still a world to win”. Play spaces in institutions such as schools, daycare centres and community centres are generally semi-public, and the institutions themselves rather than the municipality are responsible for their organisation and upkeep. When asked about policies in relation to outdoor spaces in schools and daycare centres, the initial response of those interviewed was that there were fewer difficulties in this area because regulations specify a minimum of 3.5 square metres of space per child. However, there was less clarity on who, in practice, checked that the regulations on quantity of space were being adhered to, or on what the quality of space was like. Regarding schools, a policy official from a middle-sized municipality admitted that she didn’t have much insight: “only if a school actually alerts us to a problem, do we go and have a look”. Significantly, plans relating to school accommodation deal mostly with the actual building; the schoolyard comes second. This also applies to the rapidly developing integrated school and daycare centres, where space for outdoor play is a secondary consideration. Daycare provision in the Netherlands is privatised. The officers of the municipal health service are responsible for checking safety of provision, but those interviewed were not aware of specific regulations regarding size and quality of outdoor space. In some of the municipalities there is a specific policy to make schoolyards accessible to the general public after hours, at weekends and during school holidays. This is supposed to be a response to the shortage of play opportunities in older densely populated neighbourhoods. And there are some success stories, though these remain the exception rather than the rule. Municipalities often have difficulty persuading schools to open up their schoolyard, especially if wear-and-tear of equipment and vandalism become an issue. Sometimes a deal is made whereby the municipality takes over responsibility for the upkeep and maintenance of the space, and the school in turn promises to open the schoolyard for neighbourhood use. These may include children’s farms, cinemas and theatres, and commercial ‘pay-to-play’ centres – indoors and outdoors – such as amusement parks. How do such places come about? Typically, they are established through initiatives of stakeholders such as residents, private developers, employers or other organisations. Municipalities react to such initiatives, but don’t often initiate those projects themselves. 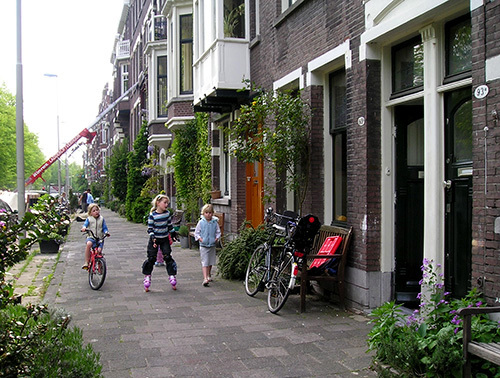 So far, municipalities in the Netherlands do not in general consider that such provisions for children increase the attractiveness of a residential area. Children’s physical spaces are not included in policies and plans of departments that do not deal specifically with youth. Research has demonstrated that children’s possibilities to move around the neighbourhood and beyond safely and independently have decreased enormously. Increasingly, children are accompanied by adults when going to school, visiting friends or going to activities such as swimming classes. To what extent are municipalities aware of children’s safety on their daily routes between school, daycare, libraries and football fields? In many local communities there are projects to improve the traffic safety around school – often initiated by the police, and sometimes by the school. Even if only a small percentage of children are brought to school by car, traffic can compromise the safety of those children who come to school unaccompanied. Parents are requested to cycle to school. Bike routes are not always safe for the youngest children nor are they always considered to be socially safe, since they sometimes go through more isolated green areas. The Netherlands is divided into 12 provinces and 430 municipalities. Policy areas related to children and their environments that are administered at provincial level include child protection, land management, and zoning issues. At municipal level, local elected representatives coordinate and implement policies for young children on education and other service provisions such as programmes for disadvantaged children, and public playgrounds. There is an interesting contrast between the high degree of attention paid to physical safety issues in designing formal play spaces – such as equipment and surfaces – and the relative absence of attention to social safety and traffic security. The costs involved in developing a specific ‘child route’ are high, and for some civil servants the endless calls for safety are too much. One remarked: “How busy are roads in such new housing developments anyway? Nowadays, there is too much emphasis on safety”. Initiatives relating to children and their physical environment are almost exclusively focused on formal public playgrounds. Children’s use of the outdoors is narrowly defined in terms of play needs only, and those needs are accommodated only in spaces specifically designed for children’s play. This is regarded primarily as an implementation issue and is isolated from broader agendas. All municipalities researched have some civil servants working in the field of play spaces. They work mostly in small, isolated, lower status departments. Success depends mainly on individual capacities and communication skills, particularly useful for getting access to the – higher status – spatial planning department. There is not much development of new policies focusing on informal play spaces or the outdoor spaces of schools and daycare centres, although these are spaces where children spend an increasing amount of time. The absence of specific norms, evaluation research, and overviews of ‘good practices’ in these areas makes it difficult to make a strong case. Nor is there much development of new policies on creating safe routes for children. While traffic safety around schools receives much support, the development of safe routes for children to increase their range of independent movement rarely happens. The play sector needs to be involved more in spatial planning from the outset. One of the possibilities to do so is the interdisciplinary development of child-friendly policies at the local level, that mirror children’s daily lives more broadly.